Gamers have been waiting a long time for true, native keyboard and mouse support on the Xbox One, and that wait may soon be over, thanks to Razer. Windows Central has apparently found documents revealing that the two companies are working together on the long-promised feature. Rich with images of slides and promotional materials, Windows Central’s report talks of a presentation with game developers and other business partners that occurred earlier this year. According to the report, Microsoft was planning on launching the long-awaited feature through the recent April Update of the Xbox One developer kit. 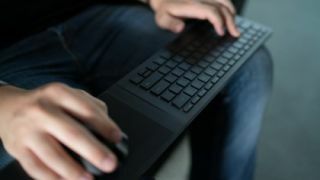 During this presentation, Razer apparently joined in, showing off how its Razer Turret keyboard – one designed for couch-borne PC gameplay – could work natively with the Xbox One, and would include support for the company’s Chroma RGB lighting software. The presentation supposedly goes on to detail how such peripheral support should be implemented into developers’ games, largely leaving it up to them to decide. Microsoft suggests that supporting games that have online play should consider altering matchmaking rules so that mouse and keyboard players are set aside from players with normal game controllers, citing potentially unfair advantages. The firm apparently already has all sorts of parameters set for the support of such devices, like the amount of mouse buttons that are supported, as well as features designed to help players find their gaming mouse cursor on the Xbox One screen. Finally, Microsoft details wide support for USB mice, both wired and connected via wireless USB dongles, however it doesn't seem to offer Bluetooth connectivity or custom driver support. It appears that this may be a result of emulation, similar to the features found in the Universal Windows Platform that have been used to bring older, or otherwise incompatible apps, to Windows 10. All that’s left is to see whether these detailed plans come to fruition. Considering how deeply they’ve reportedly been developed, not to mention shown off to interested parties, we’re optimistic about the prospect of gaming mice and keyboards on Xbox.